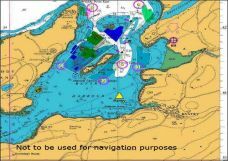 Sea buoys, fairways and channels: Entrances: The principal entrance to Bantry Inner Harbour is through a narrow but deep channel leading E of Horse Islet (Lat 51°42’N, Long 009°28’W). 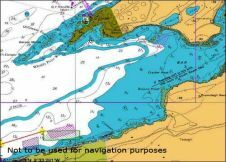 There is an alternative entrance W of Horse Islet and also a channel at the S end of the harbour leading from Bantry Bay S of Whiddy Island. This channel is suitable only for shallow draft vessels. Channel E of Horse Islet: The E channel, 1.75 cables in width with depths of over 20m, is preferable to the channel W of Horse Islet. Clearing mark: The line of bearing, 294° astern, of Whiddy Point East passes 2 cables N of Horse Islet and clear of the shallow flat on which the islet stands. The line of bearing 214° of the cliffs at Blue Hill (Lat 51°40.5’N, Long 009°29.5’W) seen between the two Chapel Islands (1nm NNE). These marks lead through the N part of the E channel passing SE of Horse lightbuoy (2.5 cables ENE of Horse Islet). E of Chapel lightbuoy (4 cables S) marking the E edge of the shoal extending from the NE end of Chapel Island East. Thence a vessel should proceed as requisite for the anchorage S of Chapel Island West. Depth at harbour entrance is 10.97m. Channel 14 is the Working Channel in Bantry Bay.